We had a great time in Cádiz! The apartment is very beautiful and equipped with everything you need for your vacation. We would love to come back one day! This is a beautifully decorated flat in a quirky and original style. 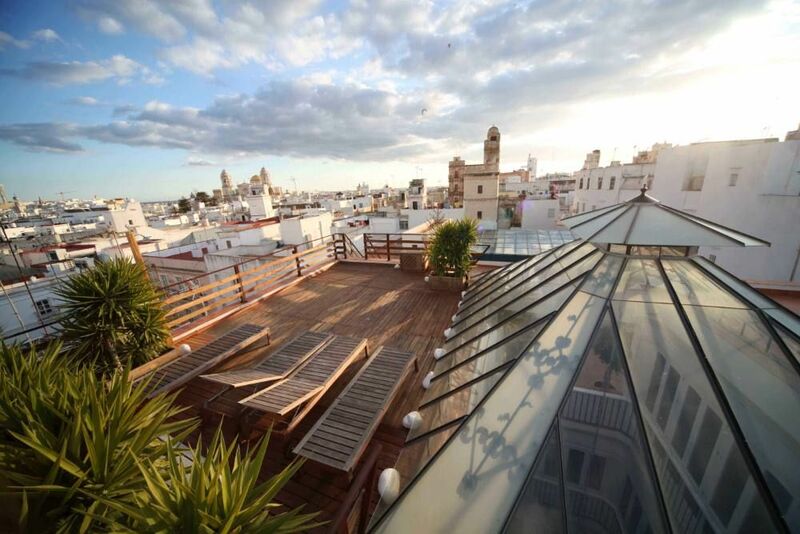 In its central location, with 2 lovely roof terraces and well equipped, comfortable living and sleeping areas, this flat is a gem. It’s perfect for 2 people and we would definitely recommend it. Arrangements for arrival and departure are really well organised and loads of helpful information about Cádiz was provided by Vanessa who welcomed us on arrival. We had a great time exploring (and eating) and because the weather was warm and sunny at the end of November, we made the most of the terraces. Thanks so much judith. Come whenever you want!! This is a great and stylish apartment for a couple. When we booked the description was 2 bedrooms. In fact there is 1 bedroom and a sofa bed in the lounge. This is not comfortable enough for 2 adults and the lounge has no storage space so we were very short of room. We would not have booked if we had known this. The owner offered to give us a refund when we complained on arrival but we would then have had to find somewhere else to stay and that would have ruined our 4 day break. We received a complementary bottle of wine in a local restaurant by way of apology. The description has now been corrected. Positive elements: the outside areas are beautiful and the lounge would have been very comfortable if we had been able to use the sofa. Good location. Cadiz es una ciudad maravillosa y el atico no puede estar mejor situado. Unas vistas impresionantes en un ambiente muy acogedor. Totalmente recomendable para pasar unos dias en esta preciosa ciudad. Rebeca encantadora, surgio un imprevisto de ultima hora y ella estuvo muy preocupada hasta resolverlo. La casa muy bien equipada y con muchos detalles. Die obige Überschrift sagt wohl alles. (Texte traduit automatiquement) contacter les propriétaires pour obtenir des informations, nous serons heureux d&#39;envoyer votre sélection personnelle des meilleurs endroits pour manger et faire du shopping ou visiter.